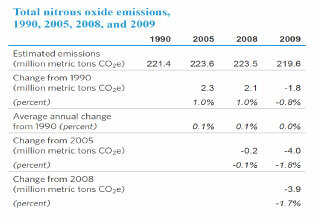 U.S. nitrous oxide emissions in 2009 were 4 MMTCO2e (1.7 percent) below their 2008 total (Table 22). 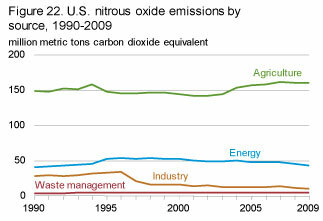 Sources of U.S. nitrous oxide emissions include agriculture, energy use, industrial processes, and waste management (Figure 22). The largest source is agriculture (73 percent), and the majority of agricultural emissions result from nitrogen fertilization of agricultural soils (87 percent of the agriculture total) and management of animal waste (13 percent). 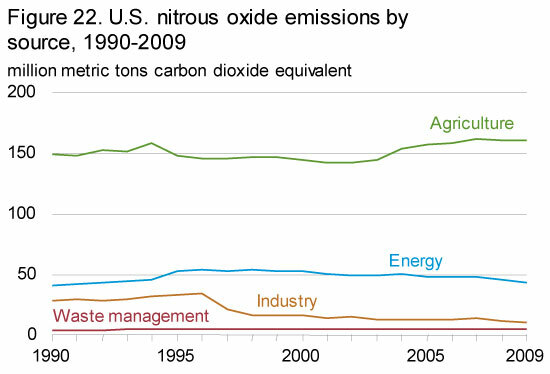 U.S. nitrous oxide emissions rose from 1990 to 1994, fell from 1994 to 2002, and returned to an upward trajectory from 2003 to 2007, largely as a result of increased use of synthetic fertilizers. Fertilizers are the primary contributor of emissions from nitrogen fertilization of soils, which grew by more than 30 percent from 2005 to 2008. 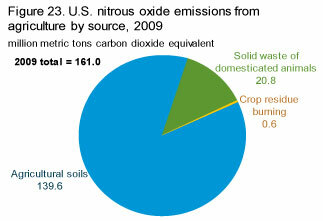 Agricultural sources, at 161 MMTCO2e, accounted for 73 percent of U.S. nitrous oxide emissions in 2009. 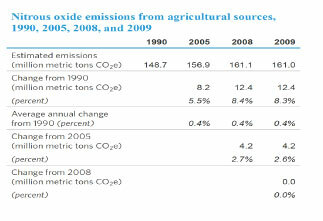 Nitrous oxide emissions from agricultural sources decreased by less than 1 percent (less than 0.1 MMTCO2e) from 2008 to 2009 (Table 23). 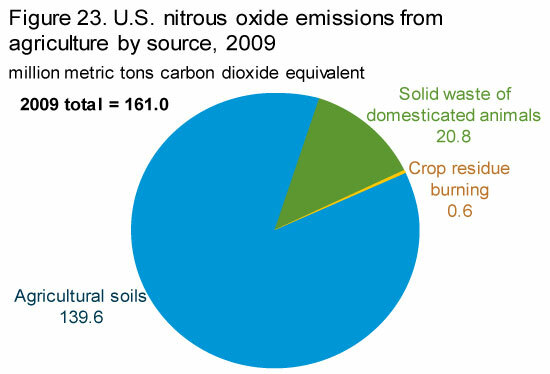 More than 85 percent (140 MMTCO2e) of U.S. agricultural emissions of nitrous oxide in 2009 is attributable to nitrogen fertilization of soils (Figure 23), including 118 MMTCO2e from direct emissions and 21 MMTCO2e from indirect emissions. Microbial denitrification of solid waste from domestic animals in the United States, primarily cattle, emitted 21 MMTCO2e of nitrous oxide in 2009. The amount released is a function of animal size and manure production, the amount of nitrogen in the waste, and the method of managing the waste. This category no longer includes emissions related to manure deposited by grazing animals. Methods for estimating agricultural emissions from nitrogen fertilization of soils have been updated for the 2009 inventory to correct for the disaggregation of organic and synthetic fertilizers, allow for indirect emissions from leaching of nitrogen only in regions with sufficient rainfall or irrigation, include below-ground crop residues while omitting biological fixation of nitrogen, and transfer emissions from manure deposited by grazing animals to the soil nitrogen amendments total (as opposed to the manure management total). Emissions from the mineralization of mineral soils are also considered for the first time in this report, although they are zero across the whole time series since 1990 because there has been a net gain in soil carbon in mineral soils over the period at the national level. Mineralization of organic soils (histosols) continues to be a very small source of emissions. 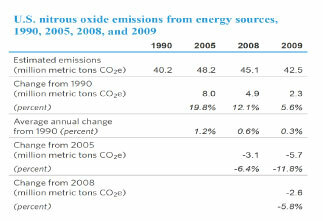 Emissions from energy sources made up about 19 percent of total U.S. nitrous oxide emissions in 2009. Nitrous oxide is a byproduct of fuel combustion in mobile and stationary sources (Figure 24). 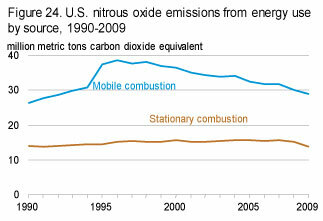 About two-thirds of U.S. nitrous oxide emissions from energy use can be traced to mobile sources—primarily, passenger cars and light trucks as well as other motor vehicles (Table 24). 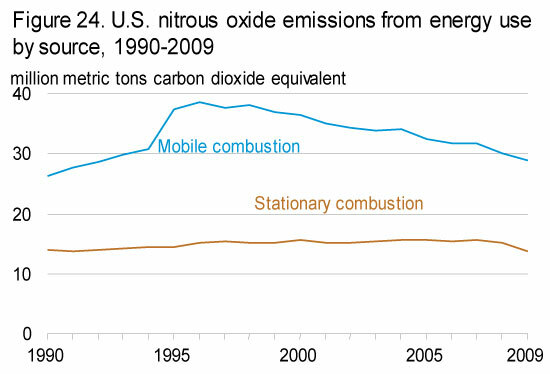 Emissions from mobile sources dropped by 3.9 percent (1 MMTCO2e) from 2008 to 2009, primarily because of a 7.7-percent decrease in emissions from passenger cars and light trucks. Vehicle miles traveled by passenger vehicles were 2.4 percent lower in 2009 than in 2008, in part as the result of the economic recession. Nitrous oxide emissions factors for passenger cars and light-duty vehicles have been revised to the values published in the 2006 IPCC guidelines, resulting in a significant decline in calculated emissions from this source category, as described in previous reports. 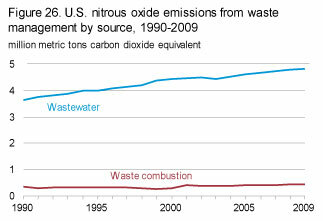 Nitrous oxide emissions from stationary combustion sources result predominantly from the burning of coal at electric power plants (8 MMTCO2e, or 60 percent of all nitrous oxide emissions from stationary combustion). 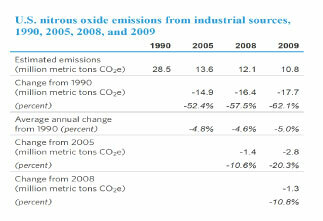 U.S. industrial sources emitted 11 MMTCO2e of nitrous oxide in 2009, a decrease of 10.8 percent from 2008 (Table 25). 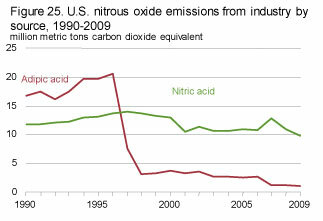 The two industrial sources of nitrous oxide emissions are production of adipic acid and production of nitric acid. Nitric acid, a primary ingredient in fertilizers, is manufactured by oxidizing ammonia with a platinum catalyst. The oxidation process releases nitrous oxide emissions. Adipic acid is a fine white powder used primarily in the manufacture of nylon fibers and plastics. There are three companies operating U.S. plants that manufacture adipic acid by oxidizing a ketone-alcohol mixture with nitric acid. The chemical reaction results in nitrous oxide emissions. 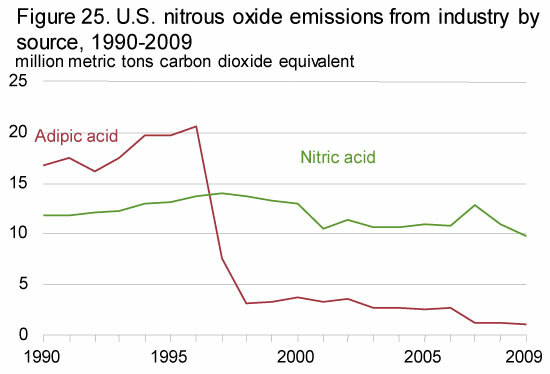 The large decline in nitrous oxide emissions from industrial processes since 1996 (Figure 25) is a result of the installation of emissions control technology at three of the four adipic acid plants operating in the United States before 2006 and the closing in 2006 of the only U.S. adipic acid plant without emission control technology. Emission estimates for 2007 and 2008 published in this year's report have been corrected to account for the plant's closing, as indicated by the zero values for uncontrolled sources in 2007, 2008, and 2009. In addition, the nitrous oxide emission factor for adipic acid production has been revised to the value published in the 2006 IPCC guidelines. 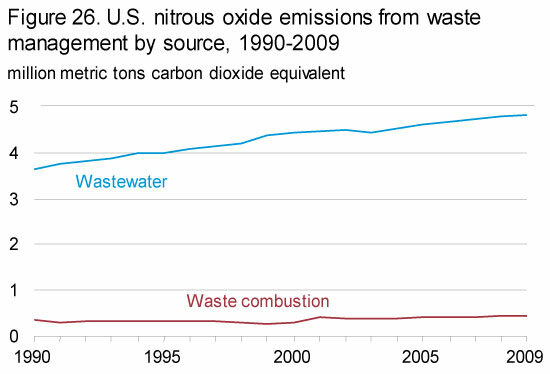 In 2009, treatment of residential and commercial wastewater produced 92 percent (5 MMTCO2e) of all nitrous oxide emissions from waste management. 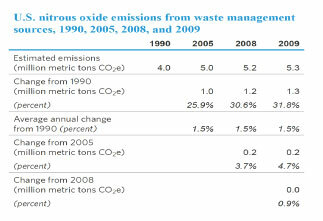 An additional 0.4 MMTCO2e was emitted from the combustion of municipal solid waste (Figure 26 and Table 26). Estimates of nitrous oxide emissions from domestic wastewater treatment are directly related to population size and per-capita intake of protein. Nitrous oxide is emitted from wastewater that contains nitrogen-based organic materials, such as those found in human or animal waste. Factors that influence the amount of nitrous oxide generated from wastewater include temperature, acidity, biochemical oxygen demand, and nitrogen concentration.